Be the first to know as we launch in new countries and markets around the globe. Interested in bringing MIT Technology Review to your local market? How Will We Interact with Virtual Reality? Mistry explains how his technology, SixthSense, works. Retrieving information from the Web when you're on the go can be a challenge. 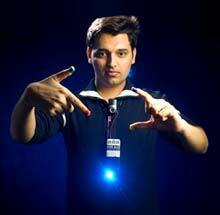 To make it easier, graduate student Pranav Mistry has developed SixthSense, a device that is worn like a pendant and super­imposes digital information on the physical world. Unlike previous "augmented reality" systems, Mistry's consists of in­expensive, off-the-shelf hardware. Two cables connect an LED projector and webcam to a Web-enabled mobile phone, but the system can easily be made wireless, says Mistry. Users control SixthSense with simple hand gestures; putting your fingers and thumbs together to create a picture frame tells the camera to snap a photo, while drawing an @ symbol in the air allows you to check your e-mail. It is also designed to automatically recognize objects and retrieve relevant information: hold up a book, for instance, and the device projects reader ratings from sites like Amazon.com onto its cover. With text-to-speech software and a Bluetooth headset, it can "whisper" the information to you instead. 1. Camera: A webcam captures an object in view and tracks the user's hand gestures. It sends the data to the smart phone. 2. Colored Markers: Marking the user's fingers with red, yellow, green, and blue tape helps the webcam recognize gestures. Mistry is working on gesture-recognition algorithms that could eliminate the need for the markers. 3. Projector: A tiny LED projector displays data sent from the smart phone on any surface in view--object, wall, or person. Mistry hopes to start using laser projectors to increase the brightness. 4. Smart Phone: A Web-enabled smart phone in the user's pocket processes the video data, using vision algorithms to identify the object. Other software searches the Web and interprets the hand gestures. So the next Bill Gates is from India. Awesome. This is really amazing. He has made all indians proud. The projection approach doesn't cut it for me from a practical stand point. Why not add all of these up one day? The same would happen with everything that the Augmented Reality & AI could recognize. If you could tell it to keep track of things like your keys, your wallet, your tv remote controls, next time you don't know where they are you could ask your glasses to show you the last known moment where you saw them. The integration with the internet would be amazing, you could take pictures with hand gestures or voice commands, have them uploaded. The next iteration of the information society will be amazing, let's hope there are dreamers with more technical and financial capabilities than mine to make these dreams come true. i think you have a better idea i mean it can be upgraded. thats a good point of view. i want to get this device as soon as it comes to market. well my name is IMRAN and i am from PAKISTAN. i think we can be good friends...can we? Where's the practical application of this? The article states that its to speed up the amount of time to find relevant information while on-the-go.. Sorry, but I'm not going to be walking around with a camera on my chest to check my email.. Last time I checked, it takes about 3 seconds for me to take my iPhone out of my pocket and hit the e-mail button. Likewise, the technology is already built into several camera-based technologies, and also soon to be released in XBOX 360's Natal. Looks like what he did was a fun experiment, but where is the practical use for it over what is already in use today? The mission of MIT Technology Review is to equip its audiences with the intelligence to understand a world shaped by technology. Find your preferred version. Choose from six languages and in 13 regions worldwide. Explore 114 years of innovation from the most respected technology publication. Discover the most important people, companies and technologies shaping our future. Attend one of our over 400 thought-provoking live events worldwide. Have MIT Technology Review delivered to your doorstep, desktop, or tablet?